Pilonidal cysts are the sacs in natal cleft area. The exact reason for this problem isn’t known, but it’s believed to be a combination of changing hormones, hair growth, and friction from clothes or from sitting for a long duration. There are numerous factors on why pilonidal cysts happen and why they become inflamed through time. An activity that causes friction, like sitting, can force the hair growing in the area to burrow back in the skin. The body identifies this hair as a foreign body and begins an immune response against it, forming a cyst around the hair. Sometimes, a person may have multiple sinuses that connect below the skin. 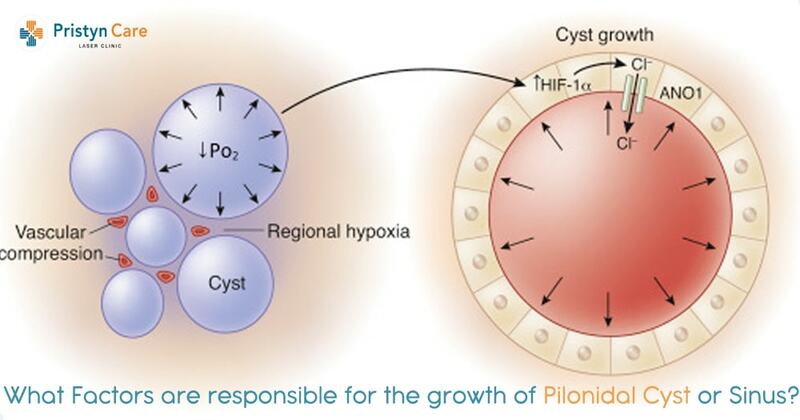 There is no apparent cause as to why this condition is more common in men than in women; however, males are more prone to develop a pilonidal cyst. Pilonidal sinus infection almost always affects people between the age of 13 and 45. More commonly, men in their late teens to the early 20s complaint about this problem. These cysts hardly ever occur in seniors, and only rarely in people between the ages of 45 and 65 years. Pilonidal cysts tend to run in families, may be due to the common factors like ethnicity and hair texture that are passed from father to son. Generally, men in their late teens at early 20s tend to get this problem. Some females also notice that pilonidal cysts may flare-up at the time of menstrual cycle due to the spikes in hormone levels. Being overweight or obese may predispose a patient to pilonidal cysts because of the increased pressure on the coccyx area. Hygiene is one of the most important factors in developing as well as in controlling pilonidal cysts. Truck and bus drivers, tailors etc. frequently suffer from pilonidal cysts as they can’t avoid sitting in a position for a long duration. People who have excessive hair growth above the buttocks are at a higher risk of developing pilonidal cysts because of the increased chances of the skin getting irritated.